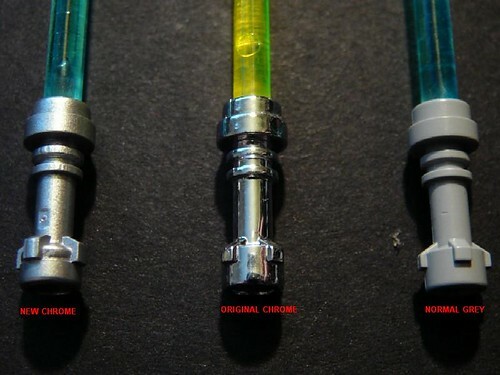 Well, I think I speak for most Lego fans who have been purchasing Star Wars legos since they were released that I was immensely disappointed when they stopped producing their chrome hilts. Now, I know that they are producing new chrome ones, but they just don't seem the same, and if you're like me, you're a collection perfectionist who can't stand minor differences in your models from year year. I know I'm being complainy and whiny, but are there other people who agree with me? Eh, I like the new ones. The "minor differences" year to year mean more options and possibilities in set design; if nothing else in this particular case means more types of 'saber handles for your Jedi, which is actually more realistic. I'm okay with that and hardly think it's a huge mistake. i agree with the poster above..
when i get my hands on the new chrome hilts.. it'll simply be classified by jedi ranks..
master for the old shiny chrome ..
And I don't mean to sond rude, but why did you make a whole thread for this when you wrote earlier in the Solar Sailor thread pretty much the same thing as you have here? I don't care that much either. It looks a lot more realistic, actually. 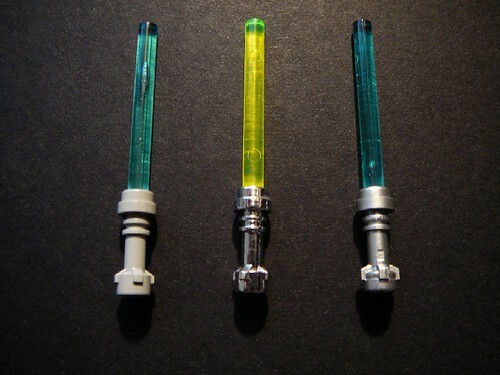 Take any picture of any lightsaber hilt; most will have a darkened hue. But I don't care about fleshy figures in licensed sets, OR of fugtoon faces, so I guess that says something. People complain about the changes in hilts, minifig faces and such, but I've never minded them. When LEGO makes changes I actually kind of like it. It makes me appreciate the older sets. In the rare case when I show my collection to someone you can point out, "this is the old version this is the new version." I've reached a point now where way more than half (75% maybe) isn't produced anymore. It feels good to tell people "This they don't make and this one and this one and..."
As far as the chrome, I always got an extra one with every set. I still have extras for the new figs, so I just put the old chrome with the new figs. I wouldn't classify this relatively minor change as a "huge mistake". Anyone with some photo skills want to take a side by side comparison for the new vs old chrome? I've yet to grab a new set so I didn't even know we were getting shinys again. I haven't seen them in person yet either, but I imagine it's along the same lines as the new swords/helmets in the Castle line. You can see the colour here. It's not a comparison shot, but you can tell it's deifferent to the old chrome ones. I think the new hilts look much better then the older ones. The older ones were way to flashy, and did you ever see a Jedi with a lightsaber that they could probably see their reflection in perfectly? I can't say I have. Well, Anakin had a chrome one in ROTS. All the props and their replicas were chrome like the old Lego sabers, but straight in the movie you couldn't exactly tell because you wouldn't be paying that close of attention to the lightsaber handles. It was more likely you were watching the duel. Seeing as how you're someone "who [has] been purchasing Star Wars legos since they were released", shouldn't you have more than enough spare chrome hilts? I know I do. 'Cause they kinda sorta included an extra one in every set. About all but two of mine have gotten worn down to the color underneath the chrome. I really like the flat bley ones because that doesn't happen. Ok, reading all the responses, I have to agree that I'm probably being weird about this. As to why I created a brand new thread, I didn't guess that very many people read all pages of every thread on this forum. Guess I was wrong. But if you read that post under the Solar Sailor thread, then you'll see that I also agree about changing the skin tones. And I do like the new chrome hilts, really I do. I now just hope I get to nab enough to have for later on. I notice that they were always chrome, but what i was saying is that the chrome used on the original hilts is VERY shiney and reflective. (You could probably use it as a mirror) and the ones in the movies were still chrome, but not that reflective or shiney. They were more of a dull chrome. Sorry if that didn't make sense. I would like to know what those sabers look like, though. I understood, but I wouldn't call the movie sabers "chrome." The hilt was simply metal, and most metal have some "shiny" property. Not that this matters, though. Biggest mistake was juniorization in the mid-90s. You can see the colour here. It's not a comparison shot, but you can tell it's different to the old chrome ones. I quite like the new ones ... they certainly better than not being chromed at all. In some respects, they look better now than they did originally. Thank you. I don't see at all how people are calling these chrome. I'm pretty low on the list of people to complain about proper nomenclature, but chrome doesn't apply here. It's an existing color even, metallic silver. Who's perpetuating this nonsense? Also, holy crap, did I just spell nomenclature correctly? Honestly, I had no big problem with the gray hilts. I liked the old silver ones, but I'll have to switch to the new chrome now. Wow if you think this "minor" change is a huge mistake, then what about the col... nevermind. Anyone else like the little bubbles you sometimes get in the 1X4 bars used as the blade? I find it really cool. My site which can only be described as terrible. I also haz Flickr and BrickShelf.